I had to sit on this read for a bit after Batman #686. “Whatever Happened to the Caped Crusader?” is an unmistakably moving slice of Bat-verse, but it’s singular nature demands hard swallow to add up the parts of what Neil Gaiman and Andy Kubert put together here. Does this story deserve a place in the Pantheon of top Batman stories ever told? No, but I think people will still read it and mention it ten years from now. I don’t think it will be remembered vividly alongside Alan Moore’s “Whatever Happened to the Man of Tomorrow?” and consistently mentioned in the same breath, but it will often be a fond afterthought to discussions of that work. Despite the finely tuned writing and elegant arrangement, story never seemed to put anything at risk for me, and the meaty subplots of Moore’s work were absent, which meant the real danger was mostly cerebral, implied and floated lightly upon the playful turns. The end result was satisfying reading experience, but I don’t feel like it added anything to the character beyond a confrontation with death that was interrupted by the “Goodnight Moon” homage at the end, which was also clever and entertaining, but a soft landing for a story that had already relieved its tension. What I’ll remember Gaiman and Kubert for in this story is their salute to the Golden Age and Silver Age Batman tales of the past. Their tour was heartfelt and worth the cover price on this issue, but I don’t believe my Batman reading experience over the last year would have been impacted on way or another if I’d read this comic when I first bought it. It’s a love poem by an all-star pair of creators, but it’s just not a Batman contribution for the ages. • Well, first off, if you doubted why I’ve been neglecting the blog over the past few weeks, it’s because I’ve been busy with day-job work. If you need links for proof, I’ve been writing about Adrien Brody and Predators, Edward Norton and The Avengers, the 2010 Academy Awards, Olivia Wilde and Tron: Legacy, Marc Webb’s Spider-Man movie, why Avatar didn’t win Best Picture, and the list goes on. There was also a trip to Liverpool in there somewhere that involved a fascinating tour of the Bizarre Creations studio in Liverpool. I wrote quite a bit about Blur shortly thereafter. Most of that was done in excess of my typical weekday workloads, so the keyboards have been getting plenty of exercise. • James Kochalka appears in the trailer for this new film called Mars that I’m interested in watching some day. • I linked to this video for “70 Million” by Hold Your Horses on my Tumblr a long time ago, but I’m still watching it like mad. 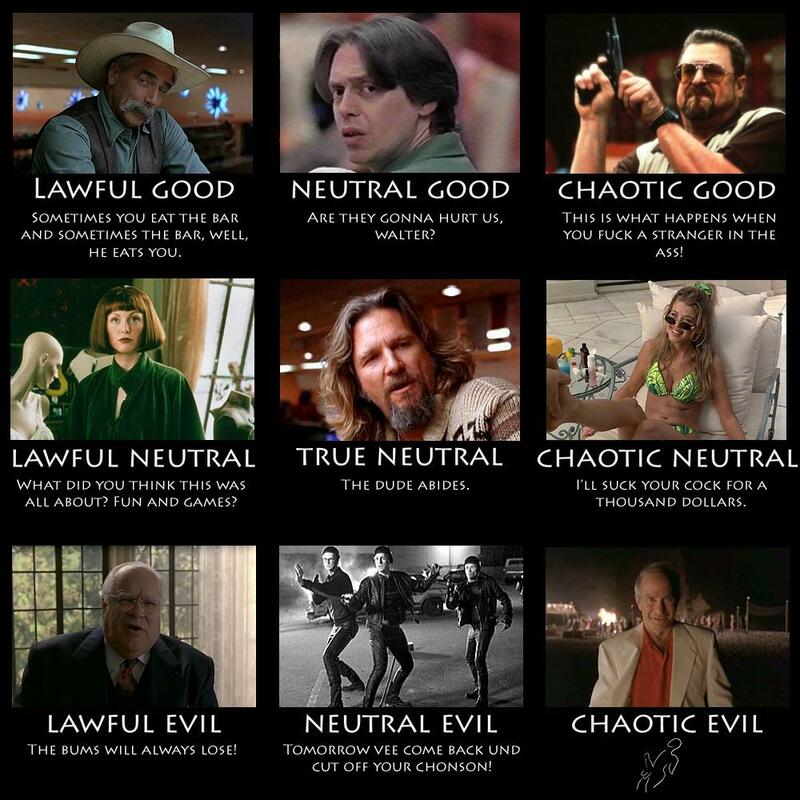 • I’d managed to be an Internet citizen for some time without ever encountering the <Doctor Who alignment chart or the Big Lebowski alignment chart. If I wasn’t behind before, I have completely jumped the shark now, but it’s time to soldier on. I read Neil Gaiman and Andy Kubert’s Batman #686 eons ago, but for some reason I purchased part 2 of “Whatever Happened to the Caped Crusader?” in Detective Comics #853 and immediately forgot until last weekend when I pulled it out of a stack of my unsorteds. As an homage to Alan Moore’s two-part Superman story “Whatever Happened to the Man of Tomorrow?” from Superman #423 and Action Comics #583 the premise almost handicaps a fair reading — and would if virtually anyone other than Neil Gaiman were the one writing the script. I almost wish it were titled something else, though, just so I wouldn’t feel like it needed to establish a symmetrical relationship with Moore’s work. What Gaiman wrote is brilliant, it’s moving and it so clever it will make flowers bloom from your eyes, but what it does instead of taking you on a surgical colon-cam through the title character’s world (as Moore’s tale did) is to re-evaluate Batman through a carefully aligned sequence of narrative prisms that alleviate all necessity for truth to history and continuity and boil Batman down to an essence in relation to his world’s cast members. This issue is a page-by-page Wonderland that opens up with heroes and villains attending a funeral, and it has this sort of Canterbury Tales feel to it because Gaiman frames and cites the narrative so well. The Alfred thread is by far the most compelling element of the story and part of what makes “Caped Crusader” unique when held up next to “Man of Tomorrow.” Whereas Moore set up a kind of whimsical psychological pinball game of plot threads, Gaiman is content to let his storytelling and construction do the heavy lifting without bringing in too many fight scenes or epic memorable visuals — and Kubert does what he needs to, but you won’t come out of Batman #686 with any iconic scenes stuck in your head for the road. That’s probably the biggest weakness of part 1, which I thoroughly enjoyed. It just suffers from its name more than it should be forced to. The Oscars may have forgotten you in their montage, but Warmoth.org will not.